I started the new Season with great powder in the last days of November. But the real kick off is right now, when Christmas vacations are starting soon and university libraries close their doors. Yesterday I made a brief visit to a place, where I had loads of happy snowboarding moments, the livingroom Hochkönig and his organizer Pez Radacher (www.livingroom-hochkoenig.at/). They have a range of different events in this rather small, but all-natural-snow resort. Last weekend splitboarding.eu had a splitboardtestival there, where one could compare the various different systems intended to make hiking up equally enjoyable as riding down. And Pez showed some gems from the (here it comes!) 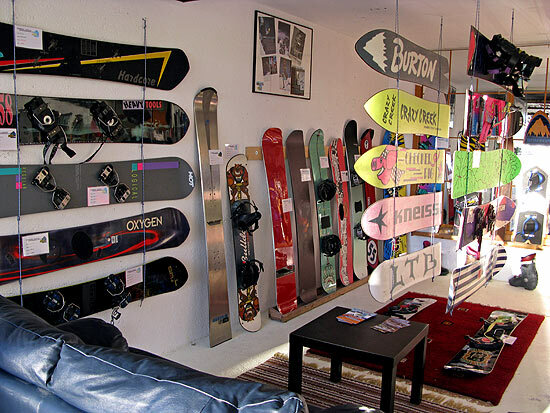 snowboard museum. I’m not really sure if old sports gear is as exciting for everybody as it is for me, but I love those old ridiculous binding systems (which weren’t ridiculous at their time) and crazy shaped and cut up old boards. As snowboarding was invented by people with a strong sense of creating stuff, the snowboard museum has a lot of different developments to showcase. Depending on preferences, one can combine the visit with park riding (not set up yet), mellow tree runs or serious touring/splitboarding on Hochkönig. Later in the season, the livingroom will also host a judged freeride contest and chinese downhill events, where, some years ago, I started competing.